Program Synthesis - I talked to a lot of other people about program synthesis and built things with some of them. 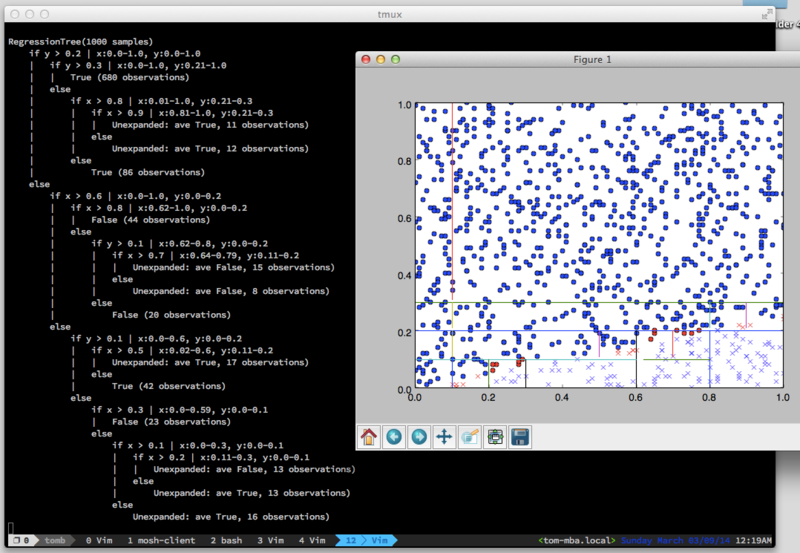 The regression tree work resulted in a nice visualization. I use trees a lot of course, but rarely write so many from scratch in a week. For most of these, I found myself building up functions for a bit (as in the top half of this regression tree code, then starting to go object oriented once I got to the nesting part. The pain point that prompted this seemed to be writing recursive text representations of the trees: I wanted __repr__ magic so much that I’d give up my simple, transparent data structures of tuples and dictionaries for opaque objects. I’d also start with instance attributes when the tree was a single node, then move to dynamically calculated properties once the property of a thing starts to depend on its children trees. Python does have some pain points for recursive data structures - the inevitable if empty / if self.left_child is None constructions kept popping up, taunting me that I wasn’t using a language that actually understood the different cases of my data structures, instead interpreting every object as a bag of attributes I had to write custom code for. Finally, tree transformations are nice! I wrote cleaner programs by building a simple tree, then expanding or changing it, vs immediately building the full tree.